Unfair on Audrey Young. Her summary is factual and fair, it's just filtered through the weekend kids at the Herald online. It really is an embarrassingly bad website. Errors abound, every day. ’old codger’ exposes himself on radio! Newstalk ZB host Leighton Smith called Jacinda Ardern a “chicky babe” during a broadcast on Wednesday. Smith was discussing one-on-one coalition talks between the Labour Party leader and her New Zealand First counterpart Winston Peter, which took place on Tuesday evening. Shortly after the 8.30am news, he invited listeners to imagine how the private discussions between the 72-year-old Peters and the 37-year-old Ardern unfolded. "How do you think the meeting between Winston and Jacinda was? What do you think?" Smith said. "Here's a guy of 72 with a 37-year-old chicky babe." Labour coalition govt - yeehah - so far so good! Against seemingly impossible odds too. Greens have overwhelmingly ratified the deal. I'm so, so, stoked. I'm just...nah gotta go, it's too much. This is literally the first time I've had basically exactly the government I wanted. Can't process. It's real, it happened, she did it. Too awesome. It’s real, it happened, she did it. Too awesome. Yep, amazing. Now the task of proving it to be the dream team. Can't wait to hear all those taking Ministerial portfolios across the three coalition partners - people who want to make progress, as opposed to excuses. We need to wait until the text of the coalition agreement gets published. All we can say at this stage is that we have a center-left government in the process of emerging (like a butterfly from a chrysalis). Leftists celebrating what seems to them a win (I share the relief & anticipation) ought to beware framing it as a victory for the left. The electorate actually rejected both the left (43%) and the right (45%). The new government has been made possible by a centrist. I'm intrigued that Jacinda responded to the question about immigration numbers by saying she's adhering to Labour policy. Is she implying that NZF agreed to their much higher number? What will the agreement actually say on this? Also, she's refrained from rejecting neoliberalism. Blog commentators are tending to interpret Winston's comment that "capitalism must regain its human face" as a rejection of neoliberalism, but I suspect this govt will merely copy Helen Clark's. Neoliberalism with sufficient greenwash to keep leftist greens happy and enough reversion to socialist intervention to keep Labour traditionalists happy. Leftists celebrating what seems to them a win (I share the relief & anticipation) ought to beware framing it as a victory for the left. I feel pretty happy calling it a win for the Left. You'd have to define the Greens and Labour as being not on the Left to not see it that way. Which, from what you've said, I think you do. If so, then the "Leftists" that you are warning here are also not the people that most people would even be calling Leftists. You're warning that subgroup of people who are to the Left of the Greens and Labour. The Leftest of Leftists. Which is me, btw. I would consider myself to be to the left of Labour, for the most part. And yet, I'm still very happy about this result. Why? Because of the alternative - another 3 years of National, a historically long term as a reward for services, um, cut, would have been far, far worse in the human consequences. Probably also the environmental consequences, although we shall see. The Greens are in government ministerial positions for the first time in NZ's history. How that could be anything short of a fantastic result for the Greens is beyond me. The Green ratification of Labour's coalition with Peters was by an overwhelming majority. Sure, it's Peters. We've been here before. But this time he's compromised to bring the Greens into government. I seriously doubt he did that to shaft them. But yes, we'll see. I'm not, however, going to fail to celebrate the occasion, and the astonishing accomplishment of Ardern here, and what it means for what I consider to be NZ's Left. It means a lot. The Greens are in government ministerial positions for the first time in NZ's history. How that could be anything short of a fantastic result for the Greens is beyond me. It's a first for Australasia. As long as Australian Labor remains in thrall to big mining, both major federal parties there will collude to keep the Greens marginalised. It's probably too obvious to mention, but this choice serves an important practical purpose for Winston First too: joining a more fragmented government gives him and (more importantly for succession planning) many of his party's MPs more of a chance for media attention over the term. If Peters doesn't like either Labour's or the Greens' positions on an issue, he can still take a contrary position in the media without fear of reprisals. Allying himself with National, essentially being absorbed into them for most practical purposes, would have given NZF far less freedom, and far more risk of oblivion at the next election. Both times NZF previously joined the government, its support fell below 5% at the next election, so this has to be an important consideration. However you may have a point here. It's in our common interest that this new govt survives its term & delivers suitable results as specified in the coalition agreement. The coalition, if we choose to see the Greens as part of it, is potentially as stable as a three-legged stool. I remember when those were a standard part of household furniture: people who sat on them didn't fall off (unless drunk). Jacinda will prioritise demonstrating the stability of the design to get a mandate for a second term, so waka-jumping legislation is obviously necessary - to ensure that history does not repeat itself! It's in our common interest that this new govt survives its term & delivers suitable results as specified in the coalition agreement. It's often forgotten but worth remembering that in Oz the Gillard minority government got an awful lot done and was very stable, except at top where Rudd worked tirelessly to support the News Ltd line that a female prime minister was by definition incompetent and hopeless. Somehow the stream of legislation that passed went without note, and the lack of glaring failures possibly made that necessary. In many ways I hope the Arden government has a similar experience, trusting the NZ public to be a little more grown-up about their take on it (that will help keep the media in check). But then, NZ is more used to having women in charge and, dare I say it, less thoroughly misogynistic than Australia. On the topic of political change, I came across the above (rather sad) letter whilst I was continuing to empty and abandon my university office today. 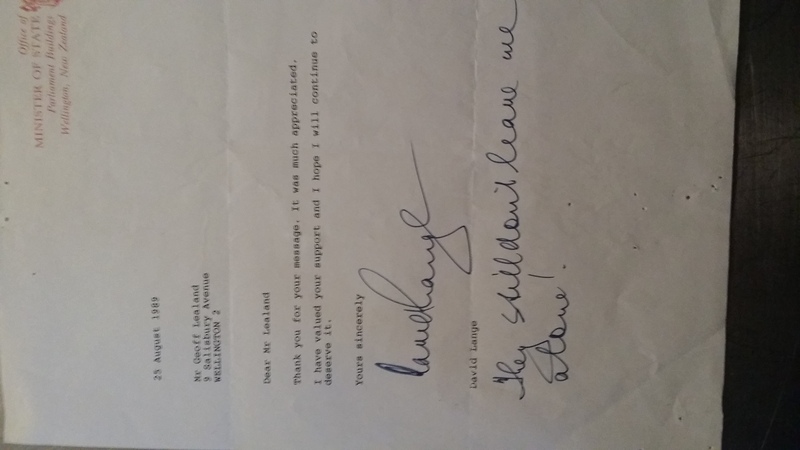 It is dated not long after Lange resigned from Parliament. so waka-jumping legislation is obviously necessary – to ensure that history does not repeat itself! I don't reckon. It's one of the few actually good things about elected representatives, that they can actually break from their party under conditions that they find compelling enough. Parties are still the shadow cast over our democratic system. MMP recognizes them, balances them. I don't see that it's MMP's job to make them more cohesive and powerful than they already are. I don't see that it's MMP's job to make them more cohesive and powerful than they already are. I share that sentiment. I was endorsing the agreement of Labour/NZF because I believe it is more important that the new government succeeds. If, at the end of the electoral cycle, it can be seen by fair-minded voters to have served the public interest via genuine collaboration, that will set an excellent precedent for the future. I believe that common good currently outweighs any potential downside. Seems no one can be relied upon to keep themselves in check anymore, including the media. I'm thinking of Spinoff who commissioned a former National ministerial adviser to write a puerile piece that the Nats must defend against "socialists and populists" Using cooked statistics about how well capitalism has served us! If you are referring to Wayne Mapp, I would note that he has long been the kind of guy who writes long pieces and publishes them on various sites, like Pundit and I have noticed that there is some crossover between of the non journo writers. I'm making the wild assumption that there is a small pool of non journos willing to write opinion pieces for small / no money. able to afford to do so. Just as the Hooverites and Forbes-Coatesians were caught off guard by the 1930s Great Depression, today's Thatcherite/Reaganomic holdouts must have slept through the Great Recession and the bank bailouts. Ron Mark ain't helping... promising new spending on the fly. Ron and Shane Jones will sink Winnie's legacy between them.Both arrogant, both entitled, both spoiled brats. Now, I know we’ve all been chortling at Mike Hosking’s descent into self-parody with his pissed off and splenetic daily outbursts, but should we spare a thought for David Farrar, who by the look of Kiwiblog is also struggling with multiple stages of grief and denial? I mean, it is obvious that every day he awakens, slaughters a chicken and eagerly scans it's entrails for portents of coalition collapse. He may need a comforting corner when he realises it is just denial.